Link to the latest Polio Report from Lindsay Ford. Link to Otago Youth Adventure trust - Milton Rotary Tramping Club - 2016 season update. Link to Megan Hammerton’s Blog - check out videos of Easter Island Visit. Link to Rotary Weekly - 2 July 2015. Link to Rotary Service - June 2015. Link to Rotary Global History Fellowship Our Foundation Newsletter #161. Link to Rotary Young Leaders in Action - June 2015. 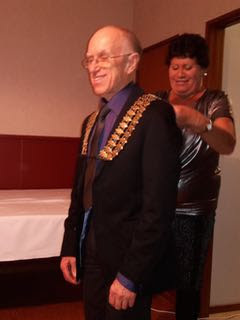 On Wednesday evening Kaikohe Rotary had a changing of the guard when 2014/15 President Liz Henley handed over the chains of office to her successor Don Edmonds. Members a, guests and supporters of the club came to Wildspur to enjoy the hospitality and cuisine provided by Ray and Vivienne Davies. President Liz presented Elizabeth Killen with a Paul Harris Sapphire Pin for her many years of service to Kaikohe Rotary including being President and 10 years as Secretary. Liz then presented her annual report outlining a busy year of activity and community service before handing over the chains of office to incoming President Don. Our new leader said he was delighted to take command of the Kaikohe Rotary waka before naming Glenis Sutherland as Secretary and Jim Shaw as Treasurer. But he wants members to set the club's direction for the club at a forum at next week's meeting before naming the rest of his team. It'll be an exciting year ahead.